Seals, which a few years ago abounded along this coast, are now comparatively rare, and before long will be entirely banished to the undisturbed and unfrequented rocks of the more northern islands. The salmon-fishers on the coast wage a constant war against them, in consequence of the great damage they do to their stake-nets, which are constantly torn and injured by these powerful animals. Nor is the loss they occasion to the salmon-fishers confined to the fish which they actually consume or to the nets that they destroy, for a seal-hunting along the coast in the neighbourhood of the stake-nets keeps the salmon in a constantly disturbed state, and drives the shoals of fish into the deep water, where they are secure from the nets. There is consequently a constant and deadly feud between the fishermen and the seals, which has almost totally expelled the latter from this part of the coast. An old seal has been known to frequent a particular range of stake-nets for many years, escaping all attacks against him, and becoming both so cunning and so impudent that he will actually take the salmon out of the nets (every turn of which he becomes thoroughly intimate with) before the face of the fishermen, and retiring with his ill-gotten booty, adds insult to injury by coolly devouring it on some adjoining point of rock or shoal, taking good care, however, to keep out of reach of rifle-ball or slug. Sometimes, however, he becomes entangled in the nets, and is drowned, but this seldom happens to a full-grown seal, who easily breaks through the strongest twine if he can find no outlet. From the shore opposite Cromarty I one day saw a large seal swim into the stake-nets and take out a salmon, with which he retired to a small rock above the water, and there devoured it entirely in a very short space of time. Sometimes at high-water and when the river is swollen a seal comes in pursuit of salmon into the Findhorn, notwithstanding the smallness of the stream and its rapidity. I was one day, in November, looking for wild ducks near the river, when I was called to by a man who was at work near the water, and who told me that some "muckle beast" was playing most extraordinary tricks in the river. He could not tell me what beast it was, but only that it was something "no that canny." After waiting a short time, the riddle was solved by the appearance of a good-sized seal, into whose head I instantly sent a cartridge, having no balls with me. The seal immediately plunged and splashed about in the water at a most furious rate, and then began swimming round and round in a circle, upon which I gave him the other barrel, also loaded with one of Eley's cartridges, which quite settled the business, and he floated rapidly away down the stream. I sent my retriever after him, but the dog, being very young and not come to his full strength, was baffled by the weight of the animal and the strength of the current, and could not land him; indeed, he was very near getting drowned himself in consequence of his attempts to bring in the seal, who was still struggling. I called the dog away, and the seal immediately sank. The next day I found him dead on the shore of the bay with (as the man who skinned him expressed himself) " twenty-three pellets of large hail in his craig." Another day, in the month of July, when shooting rabbits on the sandhills, a messenger came from the fishermen at the stake-nets, asking me to come in that direction, as the "muckle sealgh" was swimming about, waiting for the fish to be caught in the nets, in order to commence his devastation. I accordingly went to them, and having taken my observations of the locality and the most feasible points of attack, I got the men to row me out to the end of the stake-net, where there was a kind of platform of netting, on which I stretched myself, with a bullet in one barrel and a cartridge in the other. I then directed the men to row the boat away, as if they had left the nets. They had scarcely gone three hundred yards from the place when I saw the seal, who had been floating, apparently unconcerned, at some distance, swim quietly and fearlessly up to the net. I had made a kind of breastwork of old netting before me, which quite concealed me on the side from which he came. He approached the net, and began examining it leisurely and carefully to see if any fish were in it; sometimes he was under and sometimes above the water. I was much struck by his activity while underneath, where I could most plainly see him, particularly as he twice dived almost below my station, and the water was clear and smooth as glass. I could not get a good shot at him for some time; at last, however, he put up his head at about fifteen or twenty yards' distance from me; and while he was intent on watching the • boat, which was hovering about waiting to see the result of my plan of attack, I fired at him, sending the ball through his brain. He instantly sank without a struggle, and a perfect torrent of blood came up, making the water red for some feet round the spot where he lay stretched out at the bottom. The men immediately rowed up, and taking me into the boat, we managed to bring him up with a boathook to the surface of the water, and then, as he was too heavy to lift into the boat (his weight being 378 lbs.) we put a rope round his flippers, and towed him ashore. A seal of this size is worth some money, as, independently of the value of his skin, the blubber (which lies under the skin, like that of a whale) produces a large quantity of excellent oil. This seal had been for several years the dread of the fishermen at the stake-nets, and the head man at the place was profuse in his thanks for the destruction of a beast upon whom he had expended a most amazing quantity of lead. He assured me that £100 would not repay the damage the animal had done. Scarcely any two seals are exactly of the same colour or marked quite alike, and seals frequenting a particular part of the coast become easily known and distinguished from each other. There is a certain part of the coast near the sandhills where I can generally get a shot at a seal. I have frequently killed them, but seldom get the animal, as the water is deep at the place and the current strong. The spot I allude to is where the sea, at the rise of the tide, flows into a large basin through a narrow channel, the deep part of which is not much more than a hundred yards in width. If there are any seals hunting this part of the coast, they come into this basin at every tide in search of fish, or to rest in the quiet water. My plan is to be at the place before the tide has begun to rise, and then, having made up a breastwork of sand and weed, I wait for the appearance of the seals, who frequently, before the tide has risen much, come floating in, with their heads above the water. If they do not perceive my embankment, I am nearly certain of a shot, but if they do, they generally keep over on the opposite side of the channel, watching it so closely that on the least movement on my part they instantly dive. So quick are their movements in the water, that I find it impossible to strike a seal with ball if he is watching me, for quick and certain as is a detonating gun they are still quicker, and dive before the ball can reach them As for a flint gun, it has not a chance with them. Within the memory of some of the people here, seals were very numerous about this part of the coast, and were constantly killed by the farmers for the sake of their oil, and with no weapons except their hoes or spades, with which they attacked them when lying on the sandbanks. It is but seldom that I see them resting on the shore, but occasionally watch them in that situation, as they either lay sleeping on the banks or play about, which, notwithstanding their unwieldy appearance, they sometimes do. At other times they engage in the most determined battles with each other, fighting like bulldogs, and uttering loud mournful cries. In waiting for seals, attention must be paid more to the state of the tide than to the time of day, although certainly, like all wild animals, they appear less on their guard at early dawn than at any other hour. The seal generally takes the same course every day at the same height of tide, and basks on the same rock or sandbank during low-water. They show themselves much less in cold and stormy weather than when it is warm and fine. Knowing this, and having seen a seal show himself in a particular channel or basin of the sea, you may be nearly sure of seeing him there the next day about the same height of tide. The young appear about July. When first born they are nearly white, and the hair is rough and long: they gradually become spotted and of a darker colour, like the old ones. The very young ones that I have seen here were probably born about the rocks and caves of the Ross-shire coast. Some rocks off the coast near Gordonston were till very lately the constant resort of seals, but owing to workmen having been employed there of late years in building a lighthouse and other works, they very seldom rest on them at present. They were also much frightened by a plan for catching them adopted by some of the workmen. Observing that the seals when disturbed tumbled off the rocks in great confusion, two fellows, during low-water, fixed firmly into the rock several strongly barbed iron hooks, with the points turned upwards. This done, the first time that they saw any great assemblage of seals basking on the rock, near their hooks, they got into a boat and rowed quickly up to the place, firing guns and making all the noise that they could. The poor seals, in their hurry to escape, came tumbling over the side of the rocks where the hooks were placed. Several were much torn and wounded, and one was held till the men got up and despatched him. This cruel proceeding had the effect of keeping them from the place for a considerable time afterwards. Notwithstanding the great timidity of the seals, they have immense strength in their jaws, and, indeed, great muscular power in every part of their body. A farmer near the coast here, seeing several basking on the sandbanks, and not being possessed of a gun, hit upon what seemed to him the capital plan of setting a strong bull-dog at them, hoping that the dog would hold one of them till he could get up and kill it with his spade. The dog reached the seals before they could get into the water, and attacked one of the largest. The seal, however, with a single bite completely smashed the head of the dog, and flinging him to one side, scuffled away into the water, leaving the farmer not much inclined to attempt seal-hunting again. He was lying at daybreak ensconced close to the water's edge, waiting in vain for a shot at some grey geese that frequented the place at the time, when he saw a prodigiously large seal floating quietly along with the tide, not thirty yards from the shore. Donald did not disturb the animal, but went home early in the day, and, having cast some bullets for his gun and made other preparations, retired to rest. The next morning he was again at the shore, well concealed, and expecting to see the seal pass with the flowing tide; nor was he disappointed. About the same period of the rise of the tide, the monster appeared again. Donald cocked his gun, and crouched down behind his ambuscade of sea-weed and shingle, ready for the animal's head to appear within shot This soon happened, but instead of swimming on with the tide the seal came straight to the shore, not above ten yards from where his mortal enemy was lying concealed. 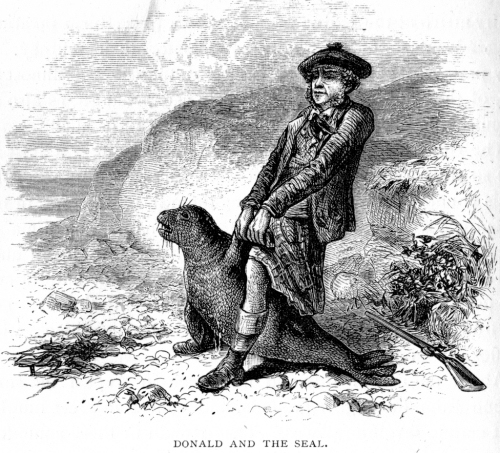 The water was deep to the very edge, and the great unwieldy beast clambered up the steep beach, and was very soon high and dry, a few yards from the muzzle of Donald's gun, which was immediately pointed at him, but from the position in which the seal was lying he could not get a shot at the head, the only part where a wound would prove immediately fatal. Donald waited some time, in hopes that the animal would turn or lift his head, but at last losing patience, he gave a low whistle, which had the immediate effect of making the animal lift its head to listen. The gun was immediately discharged, and the ball passed through the seal's neck, close to the head. Up ran Donald, and flinging down his gun, seized one of the immense fins or flippers of the beast, which he could scarcely span with both hands. The seal was bleeding like a pig at the throat, and quite stunned at the same time, but though it did not struggle, it showed a kind of inclination to move towards the water, which obliged Donald to stick his heels into the ground, and to lean back, holding on with all his strength to prevent the escape of the enormous beast. "'Deed, sir," said Donald, "if you believe me, he was as big as any Hieland stirk in the parish." Well, there the two remained for above an hour — motionless, but always straining against each other, Donald's object being to keep the seal in the same place till the tide had receded to some distance, and then to despatch him how he best could. Many a wistful glance he cast at his gun, which he had so rashly flung down without reloading; the said gun being, as he said, "but a bit trifling single-barrelled thing, lent him by a shoemaker lad, who whiles took a shot along the shore" — in other words, who poached more hares than he made shoes. I have seen these animals caught by placing a strong net, made for the purpose, across a deep and narrow channel through which they escaped when frightened off a sandbank, where they were in the habit of resting at low-water. We quietly laid the net down, fixing it at each end with an anchor; we then rowed round to the bank, and away went the seals, splattering over the wet sands into the channel; we came after them as hard as we could row. At first, when they struck the net, some turned back, but frightened on by our shouts, they made a rush at the net. We got to one end of it, detached the anchor, and began to haul it round, so as to enclose the seals; then began a noise and clamour which surpassed anything of the kind I ever heard — the seals splashing and snorting like drowning horses, while we were all straining every nerve to row round the boat, with the weight and struggles of seventeen seals, large and small, against us; my crew of six Highlanders, shouting, cursing and swearing, and encouraging each other in Gaelic — presently a more furious shout from the leader of the crew announced that something unexpected had happened, and looking round, we saw that thirteen of the seals had escaped, partly by jumping over the net, and partly by breaking through a weak part of it. One very large seal, who we afterwards found had left her young one within the net, returned in her maternal fondness to rescue it; she swam round, and finding her offspring in the midst of all the confusion, swam away again from the net, leading the way for the little one to escape also. I snatched up my gun and fired, killing her on the spot, so that she fell back into the net, and we managed to land her and the other four, and despatched them, despite their struggles, to the great joy of the salmon-fishers of the Cromarty Firth. At another time, several years ago, I was put into rather a dilemma by one of these animals: we had shot a three-parts grown seal as she was asleep on an isolated rock. Having got her into our very frail and crazy boat, we proceeded towards the land in high spirits, but before we were half-way across, our seal, who had only been stunned, the shot having merely grazed her head, came to life, and finding herself in so unwanted a position, commenced an indiscriminate attack on everything in her way: our legs being more so than anything else, we had to throw our feet up on the gunwale of the boat, and despatch her how we could, as she was tearing away, with immense strength, at the woodwork within her reach, and we expected that she would have made a hole in the bottom of the boat. We managed, however, with some difficulty to stun her again with the handle of an oar, and got safe to land with our prize, the first of the kind I had ever captured.